Our afterschool program provides a safe and healthy environment for children so that working parents can put their stress away. Our add-on classes also provide options for those who wish to utilize the afterschool hours by learning a second language. Our facilities our designed to make sure that your child enjoys coming to Ocean rain. With specialties in both Arts and Education, we combine the two to make it a seamless and fun combination. Our experienced and qualified instructors have strong education backgrounds in each field and build custom programs that suit your child’s needs. Our centre is fully licensed so children are under quality care and supervision while they spend their afternoon in variety of activities. All our staff have up-to-date First-Aid training and criminal record check clearance. Currently we pick up and drop off at Campus View and Doncaster. 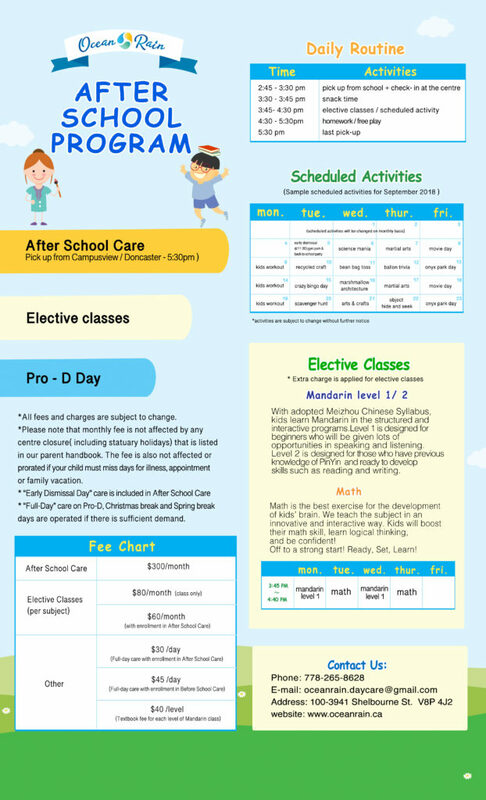 Our add-on classes come in the option of Mandarin level I & II, Math and Visual Art. By signing up additional classes, your child can learn the subject of their interest. Time is well spent here before heading home for dinner! !